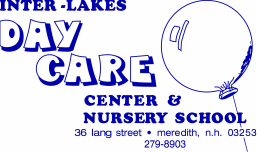 Inter-Lakes Day Care Center began as a nursery school program in 1971 in the Old Center Harbor School. Inter-Lakes licensed space next door at the old Lang Street School for kindergarten and school age children. When I-LES's addition was complete and Lang Street was closed, space at I-LES was licensed for before/after school care and summer/vacation camp. In 1992 Inter-Lakes became licensed to care for toddlers, and renovated a space in the building for our toddler program. In 1996 Inter-Lakes added licensed care for infants. Although licensed for 6 weeks old, infants must be 8 weeks old and have had their 2 month immunizations prior to attending. Each year Inter-Lakes Day Care Center provides early child care and education for over 100 children from Meredith and the surrounding communities.